It is back to school time, which means the craziness of homework, fall sports, dance and more in our house. I am always on the lookout for quick and easy recipes and I especially love ones that can be eaten on the go and don’t require a ton of ingredients. 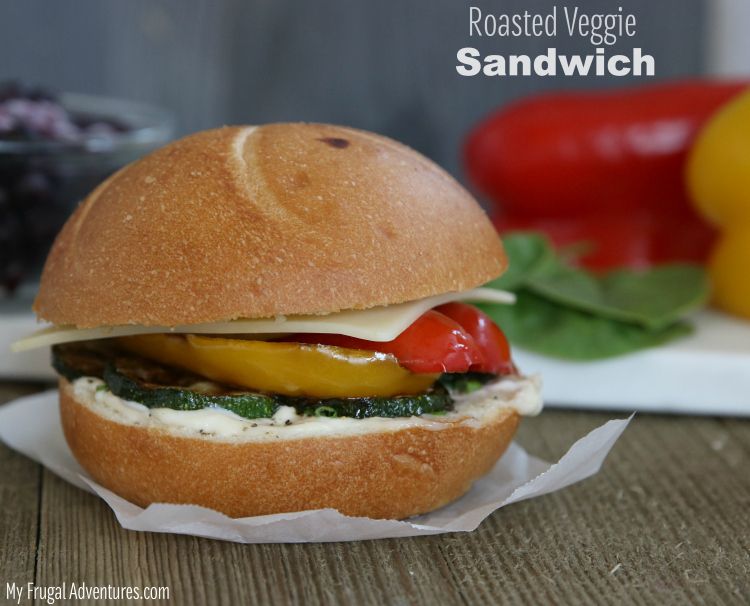 This roasted veggie sandwich fits the bill perfectly and even better it takes about 10 minutes to put together. Plus it is versatile so you can really use whatever you might have on hand- this is pretty literally a clean out the fridge kind of recipe. I have these on the menu for this week because in one night my littlest has a soccer game, big sis has soccer practice, it is Back to School night and my husband plays a game on his own soccer team. That leaves zero time for puttering in the kitchen and I know I can make these sandwiches right before school pickup, have them wrapped up in the cooler and the kids can eat them before practice and I can munch away happily and enjoy watching them play. No need for drive thrus or microwave dinners. 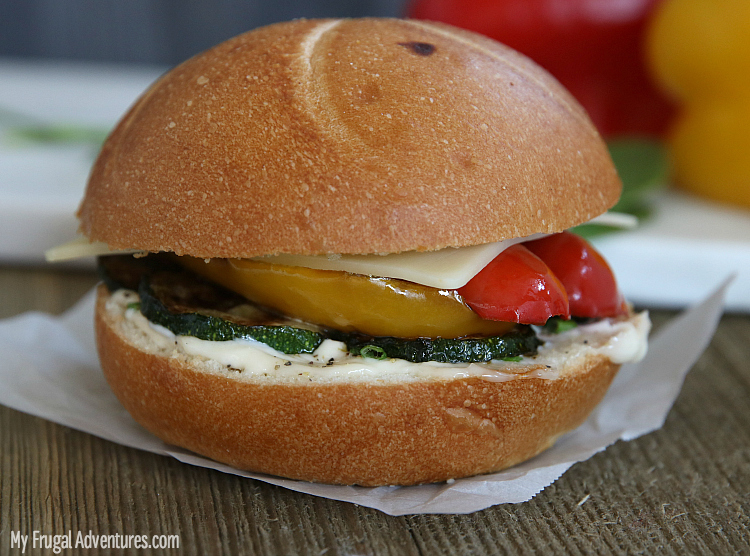 Ready for a seriously delicious and filling roasted veggie sandwich? 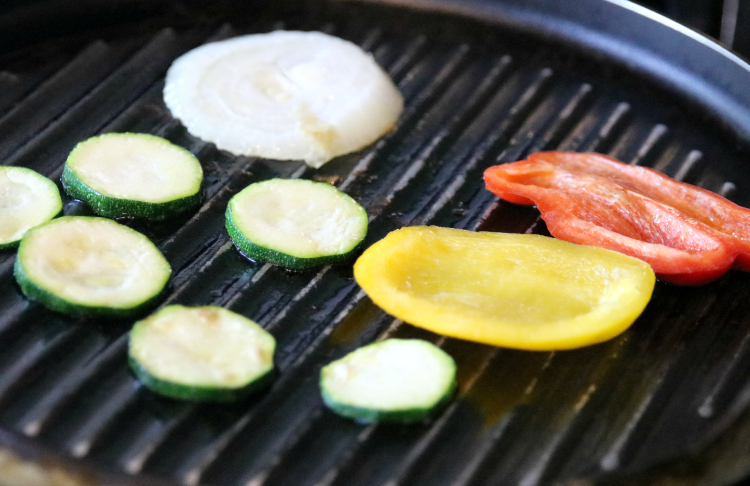 Start by roasting your veggies on the grill or on an indoor grilling pan. I like to lightly brush olive oil on each side and place them on a grilling pan for 6 minutes to 10 minutes (depending on the vegetable and the size of your slices.) Flip to evenly cook both sides. You can choose any veggies you like- eggplant, mushrooms, peppers, onions, zucchini, tomatoes all work perfectly. Just try to keep the slices equal in thickness so they grill evenly. I like all these veggies and then I just mix and match to create custom sandwiches for the kids with the veggies they like best. Once they are cooked evenly on both sides, you can slice your bread and place that on the grill too or leave as is. A great bread is always key to a delicious sandwich- I love kaiser rolls, ciabatta, a thick wheat bread, pretzel roll and so on. I start by cutting the bread/ roll and adding a slice of white cheddar cheese (again omit this or substitute your favorite cheese here)- any sliced cheese, cream cheese or goat cheese would be delicious. Next up is to add whatever condiment you prefer- I love mayo so I used a generous dollop of Best Foods Real Squeeze mayonnaise. 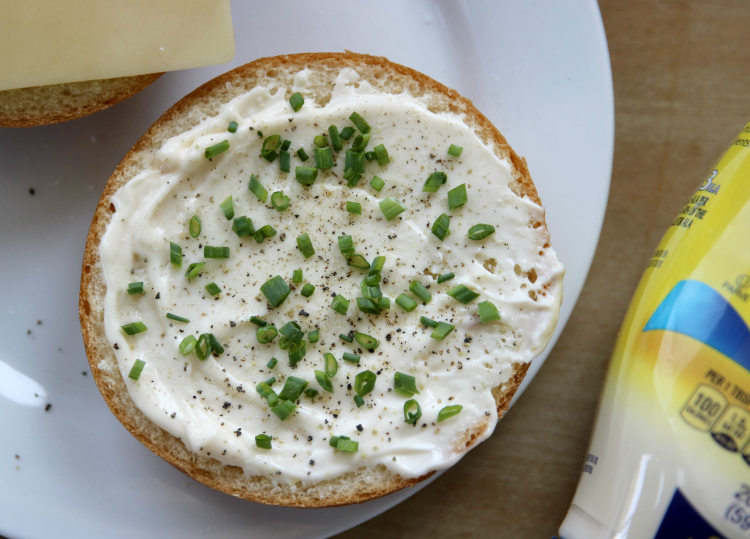 Top the creamy mayonnaise with any fresh herb of your choice- I used chives but dill would be fantastic as well or parsley- and lots of salt and pepper. You might not think mayo with roasted veggies but I think the flavor combination is perfect. Makes this sandwich so delicious and the fresh herbs add a ton of flavor. 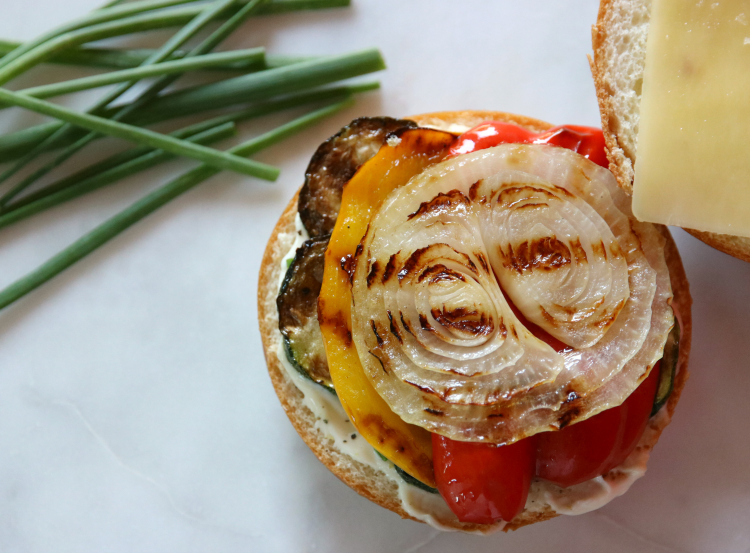 Layer on those roasted veggies and you have a seriously delicious sandwich in just minutes. The beauty of this is that you can absolutely take this to go and it will be just as good (or better) a few hours later. I was afraid the bread would get soggy but these thicker rolls hold up well and the veggies all have time to blend together. You can also add some fresh spinach to your sandwich if you like. Go ahead and pull up a chair and grab a bite! This sandwich is delicious and you won’t miss the meat at all- super filling! This is a sponsored post by Mirum Shopper. All opinions are my own. Super big thanks and high five to all our sponsors that have kept this train rolling forward for the past eight years. 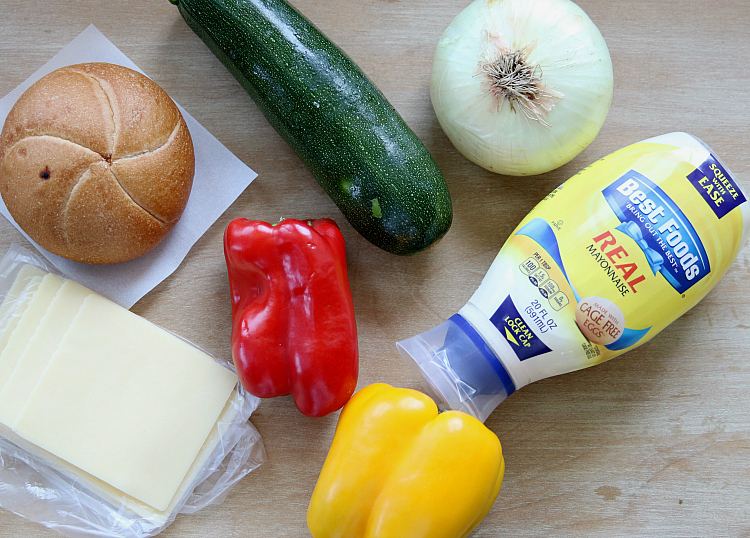 Hellmann’s® is known as Best Foods® west of the Rockies.